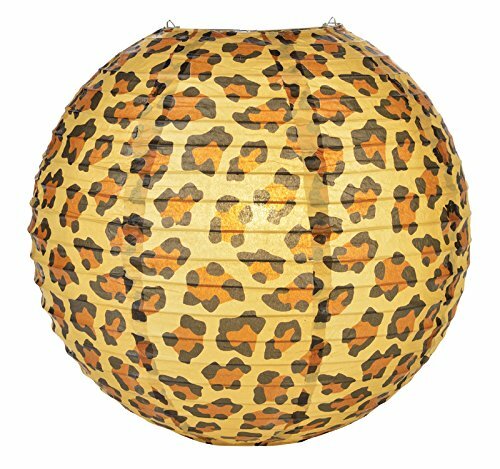 Round paper lantern with a Cheetah animal print. Paper lantern is held open with a wire expander. Dimensions: 14" dia (All lanterns sold without lighting, lighting options must be purchased separately) This is a quantity 10 PACK purchase. Round paper lantern with a Cheetah animal print. Paper lantern is held open with a wire expander. Dimensions: 14" dia (All lanterns sold without lighting, lighting options must be purchased separately) This is a quantity 10 PACK purchase. PaperLanternStore Party & Event Decorations, Wedding Décor, Party Supplies, Table Top Décor, Star Lanterns, and much more. PaperLanternStore's unique selection of paper lanterns, party decoration, wedding and table décor come in many styles to help make your next event unforgettable. Shop PaperLanternStore for Lanterns, Wedding Decor, PaperLanternStore coupons and more. Premium Quality, Selection and Service. If you have any questions about this product by Quasimoon, contact us by completing and submitting the form below. If you are looking for a specif part number, please include it with your message.